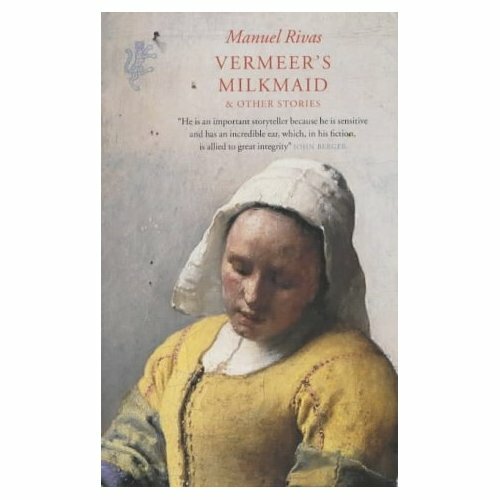 Vermeer’s Milkmaid is a collection of short stories by Galician writer, Manuel Rivas. I had to wikipedia Galicia because, shamefacedly, I didn’t know where it was. To show off my new knowledge and enlighten those others who don’t know, it’s in Spain. North West Spain, to be exact, and according to the Great Encyclopaedia, an historical autonomous community. Although Rivas writes in Spanish and Galician, the book I read had been translated into English, which was pretty handy. I talked about translation back in August, and I still believe that translator’s a hard job. You have to retain not only the meaning, but the style and inflection of each sentence. No pressure, then. I’d like to be able to read Galician, so I can make a proper observation about the translation of the stories. In this absence, I’ll just say that Rivas’ writing came across as succinct but evocative, in all sixteen stories. These were indeed, short, as the book itself struggled to reach one hundred and twenty pages. They all represented what I would call, good short stories. There was a clear plot and all of the relevant details were revealed about characters, locations, events, with just enough guess work to make them mysterious. The majority of them centred around male characters, searching for something from a long lost love to their bodies, which they have been estranged from. Most of the stories had an element of fantasy in them, from the tarot card reader who refuses to read after drawing a bad omen card, to the three page story following a conversation about murder amongst inanimate objects, from the Television to the Ashtray to the Darkness itself. Another mark of a good short story, or collection of, is how they affect you. I read A Perfect Day for Bananafish, by J.D. Salinger, in a creative writing class years ago, and I still think about it. Due to their nature, they usually revolve around a short, sharp event in someone’s life. In Rivas’ collection, an old man recounts the time where he got so frustrated with his lover’s yappy dog that he snuck back to her house at night and murdered it by ramming a steel spike down its throat. She knew, of course, and he never saw her again. The stories are haunting, full of dusty images of the Civil War and sax players. They come and go in a flash, but promise to remain in my imagination for a long time to come. I’d recommend these to people who enjoy short stories with a darker, deeper side – ones which may need careful re-reading to see all of the layers. It might help to know where Galicia is as well.